Here are two examples of the type of discussions we have at the Human Sexuality and Relationship Study with the 5th graders. The picture on the left is linked to the Bible verse we use for the study: Psalm 139:14 ~ I am fearfully and wonderfully made. The list on the right is from the Emotional Changes section of the day. 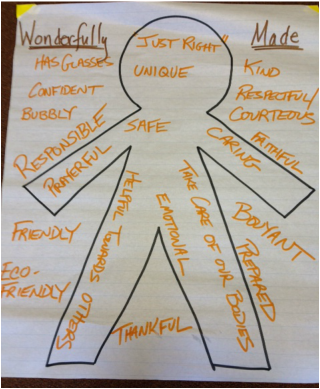 This is from an exercise where the students imagine how God would make someone "wonderfully made". My favorite is "Just right" at the top. They realized that God made us all unique and the 'just right' version of each of us. We talk about how sometimes our emotions can feel out of control and overwhelming. They brainstormed ways to focus their emotions so that they may feel comfortable and confident.